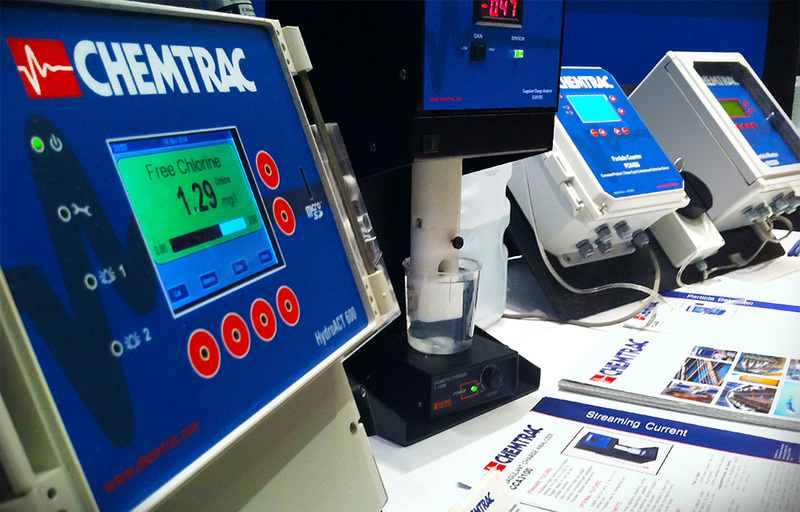 Chemtrac Exhibits at 75th Annual International Water Conference | Chemtrac, Inc. It was a milestone year for the International Water Conference. The 75th Anniversary IWC was held November 16-19, and Chemtrac was in San Antonio to take part. Of particular interest to the Chemtrac booth visitors was the PC4400 Particle Counter with the ppb volumetric concentration readout. This is particularly useful in monitoring corrosion product transport in the power industry. The PC4400 is also quite popular for optimizing filtration in RO pretreatment applications, and correlating to (and monitoring) Silt Density Index (SDI) trends. The CCA3100 Coagulant Charge Analyzer was also a big hit as water treatment operators and engineers appreciate this laboratory analyzer for determining optimum coagulant doses without having to resort to cumbersome jar testing.